I read The Spinning Heart by Donal Ryan for our 2013 Man Booker Prize collaborative project, the BookerMarks , last year. In my review I indicated it to not be a plot-driven book, but one written with strong depictions and developments of its characters. 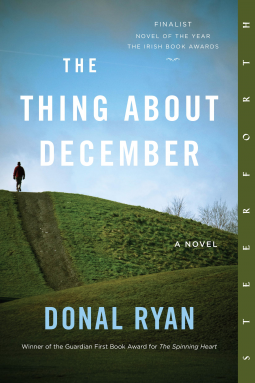 Here, again in The Thing About December, Donal Ryan demonstrates his clear strength in writing character-based novels, only more so. The Thing About December is again, not a plot-driven novel, but it is one that rises above The Spinning Heart for its characterization, notably that of Johnsey. Johnsey is the main character, and also narrates this story from his point of view. The Thing About December is really a “year-in-the-life” look into John “Johnsey” Cunliffe, beginning in the month of December. Johnsey’s father has passed away recently and his mother dies as well just a few short months later. Overall however, Johnsey could be characterized as the town’s idiot…so he’s lived a life filled with bullying and now, without his parents, a life filled with loneliness. The beginning parts of his story is filled with his longing to commit suicide. His parents have left him the farm and this comes with swirling stories of town gossip, making up stories that Johnsey is holding out to sell the land for development and make millions of dollars. This news is met with great mistrust from the village folk, as this Irish town is no stranger to economic woe. Following a particularly brutal and vicious attack from a group of guys that include his life-long bully, Johnsey is hospitalized for a lengthy time period. Here, he meets another man that is healing from significant wounds after falling off a ladder (Mumbly Dave), and whom becomes what Johnsey feels is his only friend, and the soft-spoken nurse (“Lovely Voice Nurse”). Both take a considerable interest in befriending Johnsey, but is it all owing to the gossip of him becoming a millionaire? In the end….well, does it end the way I think it ended? I will not share my thoughts because it would just take too much away from the story. I cannot say enough about how much I enjoyed this story. I was immediately drawn into Johnsey’s story, there is so much sadness about his life, but there were so many uplifting moments as well. I was lost in Johnsey’s perpetual state of sadness. But do not take that the wrong way – this was a splendid read – one where I wanted to just reach in and give that sad, sorry man a great big gigantic hug. Ryan writes with superb description, really with heartbreaking description of a man steeped in loneliness, despair and a victim of intense and lifelong bullying. Johnsey is just this poor, sad and lonely man that means no harm to anyone, he’s just trying to honour his parents memory and their farm and figuring out what in the world he’s supposed to do now that they are gone. Ryan writes about this man’s conflicted state of mind so eloquently it moves you many times over. If you are not so concerned about reading a book containing a strong plot, then I highly recommend The Thing About December. I hope you would lose yourself for a time in the world occupied by Johnsey, because as sad as it is, there was something still very uplifting, kind and gentle about it, and Donal Ryan paints this man’s life with great vivid details. Thank you very, very much to Netgalley and Steerforth Press for granting us access to The Thing About December. It’s a haunting story and one that I miss, as heartbreaking as it was to read of Johnsey’s pain. Oh for certain Karen! The Thing About December is really very good! (I thought even better!) It’s one I’m surprised didn’t make the Booker longlist?